Get behind me, Dice Gods! 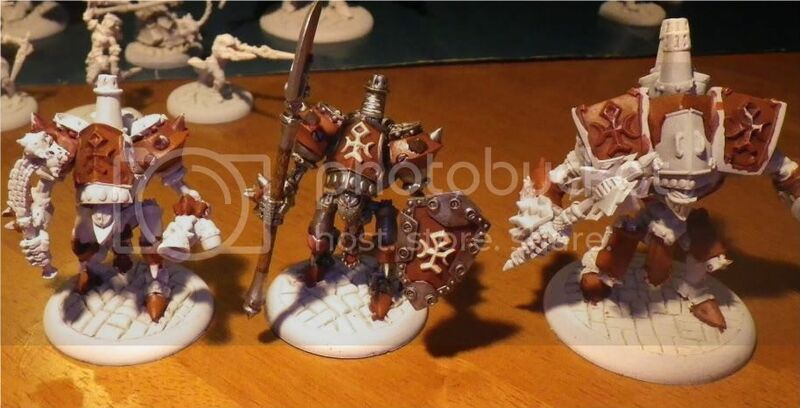 The Protectorate of Menoth Battle Box includes High Exemplar Kreoss and 2 light warjacks Revenger, Repenter and also one heavy warjack the Crusader. On the sprue, well technically they don't come on a spue as Privateer Press seal their plastic model parts in small plastic bags. Each Model and their options are included individually in a bag. This make it very handy when it comes to assembling the models. Only opening the bag your working on stops parts going missing or the wrong parts being used on a model. There are mold lines on the models, they are in my opinion quite easy to remove with a hobby knife, try not to cut yourself, my thumbs are like cutting boards from trimming mold lines. I do rate PP plastic for assembly, the tabs which join models are great. I think they put a lot of though into how the models are put together for example if there are two parts that look the same on you model they change the shape of the insertion tab and recess hole to match so left arm has a square tab and right arm has a rectangle tab. The only problem I have is the lack of instructions. Getting close to finishing my first light jack - still detail to be done. As you can see the model do take to paint nicely, there's more than enough detail on the models. This is a very simple color scheme, Lots of metal because, well it made out of metal. and the red/brown and off white bone colors which offsets nicely. I have used a lot of metallics on the model - I wanted the model to have the appearance of weight. Value / 8 - You get a lot out of the battle box for the cost - AUS dollars $50ish to buy individually $85ish with some various extra bits for the heavy warjack. 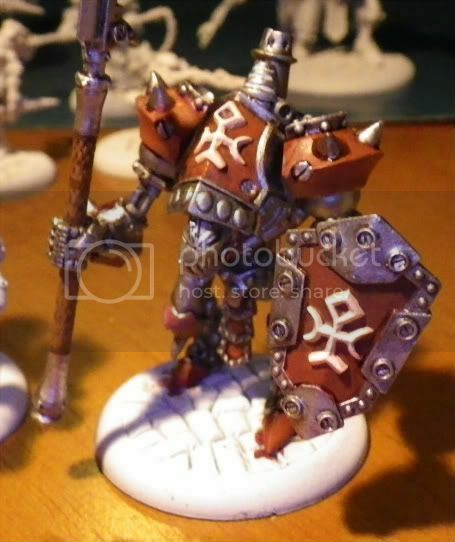 Appearance / 6 - I not completely in love with the look, Menoth might grow on me in time. There is a bit of soft edge to the models and slight lack of detail, for plasic I think there fine. Game / 8 - excellent starting point for a noob player wishing to get to grips with the game (I wish this didn't describe me) the box makes 11 points, 35 points is a normal army for tournaments. I'd recommend this to any gamer, the game warmachine always attracted me with their models but it's the value for money with start up boxs that hooked me into the game. What happened to the font? That one was hard to read, though the info was good. I really like the metal effect on the second model there. The Battle Box Bash - where to start? What’s to say? I like gaming, gaming doesn’t always like me :0) I've been playing wargames for 20+ years. I really enjoy collecting and painting miniatures for various games but Warmachine is addiction right now. I plan to dedicate this blog to the collecting and painting of armies for various wargames. My painting style is army painting, character models tend to disappear amongst the rank and file but the overall colour scheme and painting standard lend towards nice to look at from the other side of the table. I have won awards for best painted armies but only when judges don’t pick the models up for a closer look.